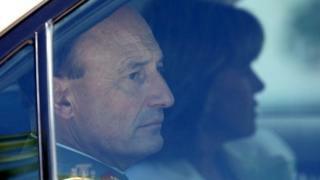 The former commander of the Chilean army, General Juan Emilio Cheyre, has been detained for alleged involvement in the killing of 15 people in the aftermath of the 1973 military coup. Mr Cheyre was a young officer at the time of General Augusto Pinochet's coup. He was accused of complicity in the killing of left-wing activists in the northern city of La Serena. The operation was part of the notorious Caravan of Death. The Caravan of Death was a a military unit despatched by General Pinochet to remote Chilean areas to hunt down opposition activists. They travelled from town to town in a helicopter. Image caption Pinochet said there would be no mercy for "extremists"
Mr Cheyre was army commander from 2002 to 2006, after Chile returned to democracy. During his time as army chief, Mr Cheyre said a coup and humans rights violations should "never again" happen in Chile. Eight other former officers have been accused of taking part in the operation in La Serena on 16 October 1973. Victims' relatives hailed the news and said it was never too late for justice. "All I want is for justice to be made and the facts to be clarified. I am not interested in vengeance," said Ernesto Lejderman, who was three when his parents were killed in one of the Caravan of Death operations. Former Defence Minister Jaime Ravinet said, however, that it was unfair to hold a young officer responsible for following orders. "Anyone who knows the military world knows that you will be taken to court or expelled from the military if you refuse to obey orders from your superior," Mr Ravinet told CNN Chile. "In 1973, during the Caravan of Death, he could have been shot dead [had he refused to follow orders]." The Caravan of Death landed in 16 towns in the north and south of Chile and killed 97 people between 30 September and 22 October 1973, according to figures compiled by the NGO Memory and Justice. Gen Pinochet seized power from the democratically-elected government of Salavador Allende on 11 September 1973. He died in 2006, aged 91, without ever standing trial for his actions.